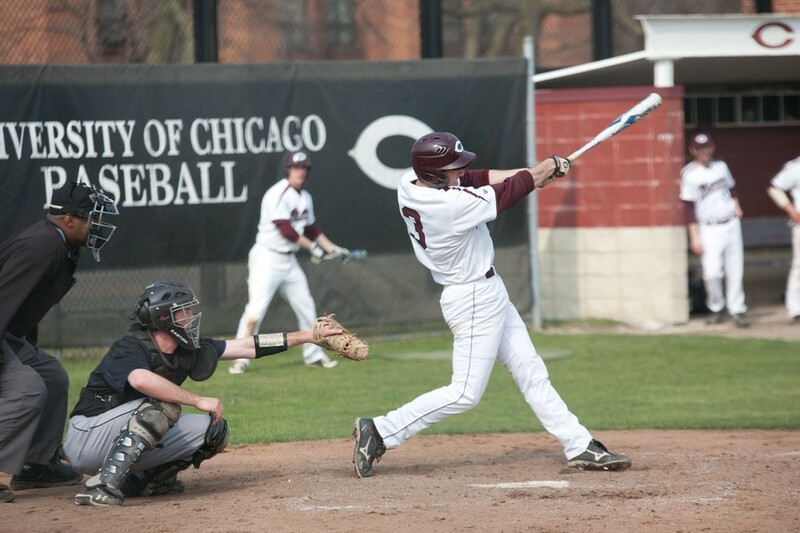 Before the rain hit, the Maroons managed to squeeze in a little baseball this week. Chicago (14–8) pulled out a 10–4 win over North Park (15–13) on Tuesday afternoon before its Wednesday matchup against North Central was postponed. North Park went out in front early, scoring a run in the first inning and holding the South Siders at 1–0 until the third. Second-year third baseman Kyle Engel hit a single in the third, plating three runners due to an error by North Park’s left fielder. Engel scored shortly after on another single from third-year DH Ricky Troncelliti to put his team up 4–1. The Maroons led for the rest of the game. The Vikings threatened to strike back immediately but were restricted to only one run in the bottom of the third. Chicago regained its momentum in the top of the fourth. Fourth-year first baseman J.R. Lopez scored on an error before fellow fourth-year Ben Bullock batted in third-year shortstop Dylan Massey to bring the score up to a comfortable 6–2. Chicago’s dominant offense received solid support from fourth-year starting pitcher Matt O’Connor. O’Connor struck out seven batters in eight innings of work, allowing four runs on eight hits. The fourth-year didn’t need to be perfect, given his run support, but he was pleased with his outing nonetheless. The South Siders scored three more runs in the seventh inning and one in the ninth, bringing their total up to ten 10 for the night. Third-year pitcher William Katzka closed the game out with a scoreless ninth inning in relief of O’Connor. The win appeared comfortable for Chicago in the end, but the players were under no illusions about the importance of the game. The Maroons have a busy few days ahead. They face North Park at home again this afternoon, play Rockford (7–15) at home on Sunday, and travel to Michigan where they will match up against Hope (17–10) on Monday. With the playoffs fast approaching, the Maroons are keeping an eye on their final goal. The South Siders have reason to be optimistic heading into their weekend games. They have just beaten their first opponent, North Park, and their second is hardly setting the world alight this season. Rockford has lost three of its last four games and is still recovering from a 10-game losing streak earlier in the year. The game against Hope presents more of a challenge. The Flying Dutchmen have shown some inconsistency in the last few weeks, splitting five of their last six doubleheaders, but they maintain a strong record and lie second in the MIAA conference. The game against North Park is scheduled to begin today at 3 p.m. on Stagg Field and play against Rockford will begin on Sunday at 1 p.m., also at home. Monday’s game at Hope is slated to begin at 3 p.m.